There’s been a lot of controversy about the Netflix show 13 Reasons Why (produced by Selena Gomez) and how it sends the wrong message to young people about suicide and mental illness. While I agree with some of the issues raised by mental health “experts,” cancelling this show would be a huge mistake, as it does help raise a dialogue that simply doesn’t exist today even in neighborhoods with the most resources to address it. And finally, after the suicides of Anthony Bourdin and Kate Spade we wake up to the fact that depression can strike anyone. This week I’ll be writing a response to the mental health experts who think the show, 13 RW is damaging to young people. Most critics state, the show doesn’t address the issue of mental illness which lies at the heart of why young people take their lives. OK, I get that. But please read the real life history I document below and tell me how it addresses the underlining causes of teen suicide. In a single year, four teenagers have committed suicide by walking in front of speeding trains. I read about them; bright, promising young people in an affluent and extremely competitive town, Palo Alto. Why? Everyone wants to know. And everyone is frustrated that no one wants to talk about it. No one wants to talk about it because no one knows how to talk about suicide, at least not in a way that can help young people. “It’s very difficult and it’s very sensitive,” Caltrain spokeswoman Tasha Bartholomew said. Is it? I think there’s another approach that parents, teachers, and students should be taking, that is by reading Jay Asher’s fine book and sitting down to watch an episode of 13 RW with their kids. I’d like to ask all the young readers a question and they are welcome to respond in whatever way that feels safe for them. Has a friend, fellow student, family member ever come up to you and confided thoughts of suicide? What did you do to help them? Have you ever read a story with a character who committed suicide? What book was it? What did you think of the story? Of the character? Parents or any adults currently reading. I’d like you to share with an answer to this simple question. What inspirational novel would you recommend to a young person who appears depressed? This is the dialogue I want to nurture on my blog. It may not be as easy as posting gushy raves about our favorite YA reads, but I think it will be rewarding to share authors who can help us deal with some really tough issues. 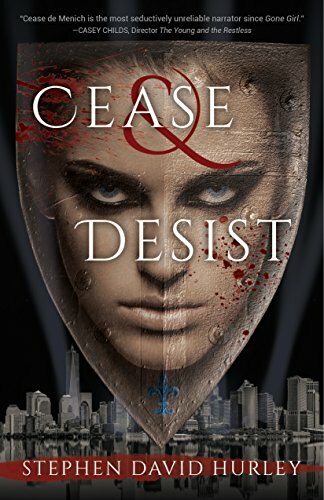 It’s tough to break the ice on a topic these sensitive, so I will give out a copy of my YA debut novel, Cease & Desist, that has a character who commits suicide before the story begins. The first two responses from anyone will get this book.